1. To make the pesto: combine everything in food processor. Pulse until finely chopped and combined. 2. 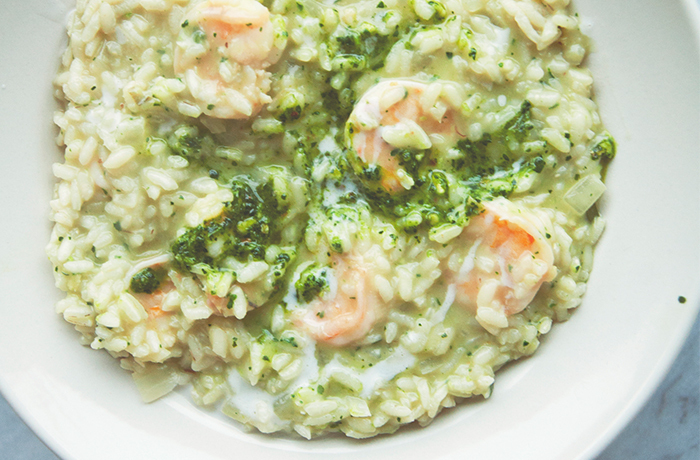 To make the risotto: pour broth or stock into pan, and bring just to simmer. 3. Heat large skillet over medium heat. Add half the coconut oil; heat until shimmering. Add garlic and green onions, then shrimp. Sauté until shrimp begin to turn pink. Add half-cup wine. Simmer until shrimp are just cooked through. Drain shrimp, reserving cooking liquid. Set shrimp aside. 4. Add remaining coconut oil and the quarter-cup onions. Cook, stirring frequently, for about five minutes. Add rice. Cook, stirring constantly for about a minute. Add remaining wine. Stir while wine absorbs into rice. Pour one cup hot broth or stock into pan. Cook, stirring constantly until liquid is completely absorbed. Heat should be medium to medium-low (not so hot that it burns on the bottom). 5. Add another cup hot broth or stock. Keep cooking and stirring. Repeat until rice is creamy and cooked through. Pour in coconut milk, stirring so rice absorbs it. Rice should be al dente. 6. Remove from heat. Stir in shrimp. Season with salt and black pepper. Garnish with pesto. Serve hot. 2015 Passarola Vinho Branco. The second vintage of our Passarola Vinho Branco confirms what the first one set out to prove: that Portugal is one of the hottest winemaking regions in the game right now! Made with the native Portuguese varieties Arinto and Ferñao Pires, Passarola foregrounds heightened aromatics and delightfully crisp flavors. Pair it with seafood, crostini, and Manchego!